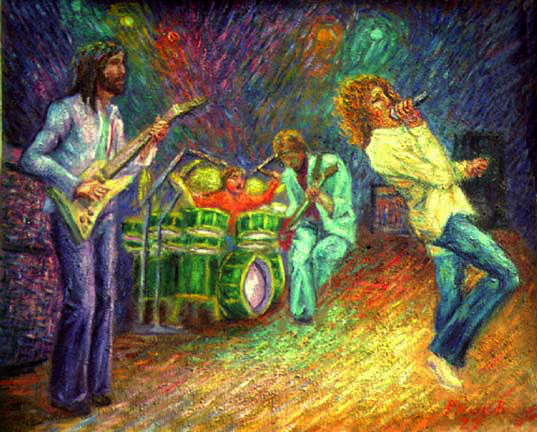 After doing several studies of the individual members of The Who I did this painting of the whole band. The Who was truly a spectacular band with Roger Daltrey, blond locks flying, using his mic like a lasso, throwing it out over the crowd, Keith Moon going wild on drums, and Bassist John Entwhistle as still as a cigar store Indian. Around all this you HAD to look at Pete Townshend as he jumped, ran, and leapt around the stage with his guitar. More than anything I've tried to capture the illusion of the motion, the feel, and music of the Who. PaulB's Pointillistic/Impressionist original oil paintings of Who and various prints and poster formats of a wide variety of subject matter by the Pointillistic/Impressionist oil painter from landscape/waterscape paintings, dance, sports, portrait, to classical figures, flowers, rock and roll, Brazil, and Who paintings and prints are available for purchase for as little as $24.95 for an 8" x 10" matted print on photo pape. Pointillistic/Impressionist Giclee prints of Who on real canvas or heavy watercolor paper are available. One of a kind Who embellished prints, which are Giclee prints retouched in genuine oil paint by PaulB. Unless noted PaulB's original Pointillistic/Impressionist oil paintiings are oil on canvas. Paul Berenson's pointillistic/Impressionist oil paintings are in privale collections around the world, including the downtown Los Angeles Athletic Club and have appeared in numerous publications, including the New York Philharmonic Playbill. PaulB.com also builds websites and PaulB is a member of the LA Web Professionals Group.